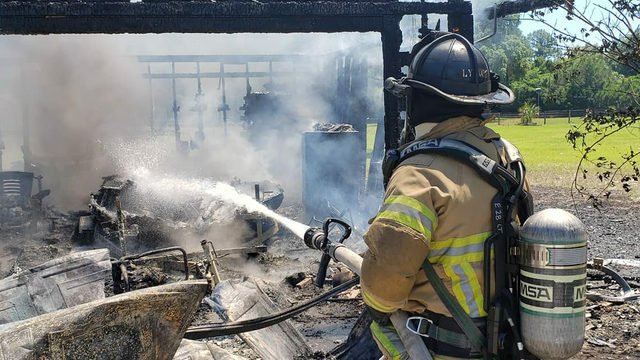 ORANGE COUNTY, Fla. - Orange County Fire Rescue officials said foul play is not suspects in the fire that killed dozens of animals at Second Chance Wildlife Sanctuary Monday. Neighbors reported the fire around 1:30 a.m. in the 800 block of Baron Road near Avalon Park. According to Orange County Fire Rescue officials, the homeowner, Jim Bronzo, was asleep in the two-story home and was awakened by the noise from 80 peacocks on property. Bronzo was able to save a few of the animals that were inside the home, according to OCFR. Bronzo said at least 30 animals, including dogs, cats, snakes and tortoises, were killed in the fire. A spokesperson for Orange County Fire Rescue Bureau said Friday the Bureau of Fire, Arson and Explosives Investigations continues to investigate the cause of the fire but investigators do not believe the fire is suspicious. As many as 350 animals, including iguanas, parrots, swans, ducks, goats, pigs, house pets and others, are cared for at Second Chance Wildlife Sanctuary. A GoFundMe page was created for the sanctuary and raised more than $93,000 in the days after the fire to help Bronzo rebuild. Businesses are also helping raise funds for the sanctuary.